Item 1: UPLIFTMENT ENERGY SERIES. Cosmic Beings of Higher Light to uplift our beings by removing energetic imprints of lack, fear, doubt, anger, resentment and others from your physical body, energy bodies and chakras. These imprints of energy are not malevolent in nature, just lower energy frequencies that we have come to see as truth. We have carried these with us from “past lives” as we slipped deeper and deeper into separation. Now, as we are moving back into unity, it is time to release these limiting imprints so that we, as human beings of great light can fulfill our divine destiny. Upliftment is the act of moving from one frequency to a higher frequency. It is an ACT OF GRACE offered to us by higher beings of light as we surrender deeply to the essence and purpose of our true Selves. The more deeply we surrender, the more upliftment we allow ourselves to experience. I am so excited about this series and I so hope you will join us for a transformational and life changing experience! Item 1: 6 audio transmissions from Ascended Master Djwhal Khul on DISSOLUTION OF KARMA. Each episode is encoded with DK’s energy and words to assist you in various stages of your karmic past. This is an efficient and easy way to dissolve karma and DK gives you encodements and easy verbiage to do it yourself! So many people have reported how much it has helped them to more easily move through difficulties in their lives. The series focuses on karmic dissolution, but DK includes so many gems of wisdom, including working with the root chakra, raising your light quotient, galactic encodements and universal wisdom. He is truly 1 of a kind and loves us deeply. In the past, SanRa has been a voice channel for Djwhal Khul at His request. SanRa has moved on to do other service work, but remains very close to DK and is so grateful for his love, guidance and support. Ascended Master Djwhal Khul, also known as the Tibetan, ascended in 1875, but retained his physical body to stay in service to humanity. He took his final ascension and vacated physical form in 1949. Two of his incarnations were Confucius and Lao Tzu, father of Taoism. He is responsible for dictating the volumes of esoteric information to Alice Baily in the early 1920’s. These books are still available today and are filled with pertinent information for our present times. with Djwhal Khul and Lord Maitreya. These programs offer an extraordinary process to free your self from old patterns at the cellular level. They may be listened to at any time, or when you go to bed, as your subconscious mind will receive the information while you sleep. These sessions are channeled and you will receive a copy of the symbols that were used to place anywhere on your body to assist in the process. Included to be released are patterns of lack, mistrust, fear, self hatred, judgement and so many more. I am writing to thank you for the wonderful Pattern Release Program. On Thursday I had dental surgery. I did the meditation that morning and had no fear, and dental work has been one of my great fears. What a gift to the world! Thank you Lord and Lady Maitreya and Ascended Master Djwhal Khul. Item 3: DJWHAL KHUL’S ASCENSION COURSE. You’re invited to join us in this 2-part audio Recording with Djwhal Khul who shares exercises and techniques in which we can experience and understand the Planetary Light Grid, and then how we can use that light within our bodies, within our organs and chakras in our own ascension process. Learn exercises to assimilate new light energies coming forth from within YOU. Session 1: As Ascended Master Djwhal Khul assists us in the process of our evolutionary growth, He will give us insight into ascension and greater awareness. He will tell us how to use our physical bodies to move into the next levels of knowing and releasing. He will help us to take the next steps to live in unity within our individual selves and to live in unity with collective humanity. Guided Transmission and Exercise: Aligning Personal Will with Divine Will. The Human Personal Will and the Divine Will MERGE in this exercise to allow you to be in the Flow of Light greater than before. this will allow the lower mental/body and the thinking Mind to be bathed and purified with this Light. Session 2: As Ascended Master Djwhal Khul helps us in our process of opening and awakening. He gives us much insight into the functioning of the Light Grids of Earth, how they work, how they are now transforming to create higher frequencies on earth, how this may affect us individually and collectively and how we can help ourselves in the process. The Ascended Master DK inspires us to understand our own personal Divine Plan for Earth. You have come to Earth to bring your light, and you will align with the Earth Star to be in harmony with Earth. To express yourself to full capacity and watch synchronicity take over! Course 2: Ascended Master Djwhal Khul is offering to assist us with our ascension process in a way only He can do. Not only does He give us valuable information about what to do in our ascension process, He gives us precious energy to move us along. He will help move people forward on the Ascension Path, so they can also be conduits for the energy, stepping it down, to assist others on Gaia to Ascend. This also helps the Earth Ascend as blockages between earth and humanity will be broken. Humanity and Earth will be working more in harmony with this energy. He helps us dissolve our karma, release our old and untrue belief systems, and helps us to be able to hold more light in our physical cells. All of these are necessary to attain our ascension. I found the Ascension, Part 2 to be particularly powerful in moving energy through my body and in uplifting my energy field. Not only will you feel lighter, but more empowered and spiritually confident in your own ability to ascend. 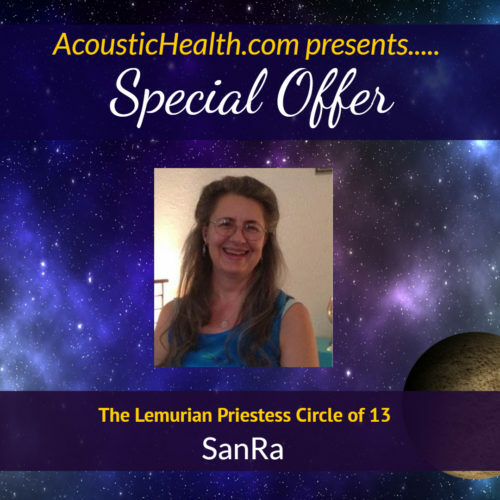 I am so filled with gratitude that I can offer these individual sessions from the Lemurian Priestess Circle of 13. They are so uplifting and filled with light, joy, love. The many Lemurian Priestess sessions I have channeled for clients have led to fulfillment of a deep yearning to find themselves again after so many lifetimes of searching. Now is the time for the re-emergence of Lemurian values, creativity, and harmony upon the earth, for your own personal self and for collective humanity. Your individual CHANNELLED session is a healing session where we, as the Priestesses usually tell you about your purpose in Lemuria and how that pertains to your life today. Your Lemurian name is sung to you and that is so powerful and moving. You will hear many chants and sacred sounds given just for you. We, as the Priestesses, offer our deep love for you and bring awakening, activation and deep nurturing. OR you may choose a LEMURIAN PAST LIFE REGRESSION session. Get your questions answered about the lives you lived in Lemuria. SanRa is a certified hypnotherapist and has done many past life regression sessions. Now she is offering past life regressions SPECIFIC TO LEMURIA. These are not channeled sessions, but will provide SanRa’s expert guidance to help you find the details of your Lemurian lifetimes. Not only will you discover amazing information, but there will be clearing of old unwanted energies and awakening of energies that you do want. These sessions are so vivid, you feel like you are really there! All individual sessions last 60 minutes and you will receive a recording. I so hope you will give yourself this wonderful gift.